Kids Club: Complimentary Child minding and activities at the 'Kids Club' with daily and different activities planned to keep the children busy! Fitness: Fully equipped gym and complimentary daily walking and yoga sessions. Food: 24/7 room service, 3 resturaunts/cafes & a convenience store on site. Surfing, Swimming/Sunbathing and Snorkeling: SWIMMING & SNORKELING: A short stroll from the penthouse will take you to the most exclusive beach in Bali at Nusa Dua. The resort has it's own beach club with sun chairs and shade + towels and chilled face clothes etc are also provided. There is also a fully stocked clubhouse and bar for those refreshing drinks and snacks that may entice you in the tropical climate. The beach has it's own life saving guards for swimmers and a natural reef to form a beautiful lagoon in which snorkeling is also popular. SURFING: Again just a short stroll from the resort and you will find the famous 'Nusa Dua reef break' which can be accessed either by a paddle out from a 10 minute walk from the beachclub or alternately take a put-put boat ride our with other surfers for a drop-off behind the Nusa Dua reef and pick-up after an allocated time which the boatman will happily provide for about U$5. British and Australian Ex-pat couple with 2 lovely girls who are Singapore career located and needed a getaway property to enjoy Bali which was suitably large and convenient for our growing family. The Nusa Dua penthouse is that property! Its perfect for our and gests needs including kids club, gym and beachclub! Dry clothes on balcony with clothes lines provided. dries in a couple of hours in tropics! Clean, modern, great beds and sofas and amenities. We stayed at this Unit for ten days and then decided to stay for our entire trip to Bali. Dean was the greatest host and responded promptly to all questions. The property was constantly being cleaned and the pool was kept in perfect condition. All the staff was helpful, friendly and easy to talk to. They helped book trips to see the temples, zoo, monkeys and everything else you could want to do. The beach is perfect and has surf breaks for al levels. There is all types of water sports that you could want. Anyone planning to go to Bali, Indonesia should stay at this property. It has plenty of room for a family of 5 and is perfect for kids. We loved our vacation and it was even better because of Dean and his property. Our stay has been amazing from start to finish. Dean couldn’t have been more helpful supplying information ahead of the visit and during. When we arrived the apartment exceeded our expectations it was so light and spacious and had everything we needed. The resort itself is lovely and everyone is so friendly and eager to help they can’t do enough for you. There is everything you could want here whether it be a beach or pool holiday or sightseeing. It’s be wonderful and we are sad to be leaving. We stayed for 6 nights and enjoyed the accommodation quite a bit. Conveniently located close to pool, restaurant and spa. Quite spacious and nicely furnished. We wanted to do some cooking and found utensils quite in order. Beach shuttle helps a lot though the walk to the beach is really less than 10 min. The beach itself is beautiful. The resort is very close to Bali Collections and shops and restaurants. Nusa Dua is a pretty place and a walk around the resort is fun too. There are also small shops very closely situated where you can bargain and buy artifacts and clothing. We did activities every day (Ubud Tour, Waterbom, Lembongan snorkeling, Padang Bai scuba diving and finally Ubud Whitewater Rafting). The travel was just a bit tedious but I do not see any easy solution unless Bali is able to improve the traffic situation. Overall, great time and great stay !! 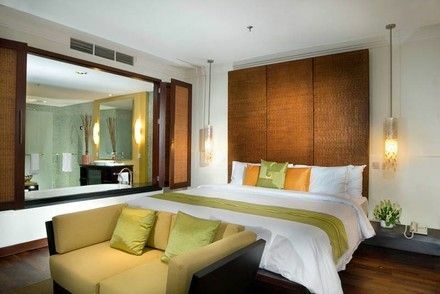 Our family loved our stay at this apartment at Nusa Dua Novotel Resort. The apartment had everything we wanted. It was clean, equipped with TV's, owner was easy to deal with and our children loved the Kids Club which meant we had time to ourselves as well. Loved the beach club that we would go to for afternoon drinks on the beach and a pizza. Back again next year. We stayed here from 6/24 to 6/29, 2013. The place is great, nice, and quiet. We have 2 kids and the hotel the property is on (Novotel, Nusa Dua) has enough activities to keep them occupied. Access to the beach is easy and the beach itself quite beautiful. Being part of a hotel gives you access to house-cleaning and room-service which is a plus. Bali-collection nearby gives you a variety of very good dining options. The owner Dean was very prompt and helpful and the transfers to and from the airport well arranged. I'd recommend this place strongly if Nusa Dua is your destination. The one comment I have is that Nusa Dua itself is made to look so Western, that you have to take a car ride to say Uluwattu or Ubud to get a whiff of any local culture. Plus you are so far south, that you have to go through a traffic bottleneck at Denpasar / Kutta which is not time well spent. They are building a freeway over the sea which hopefully makes getting out of Nusa Dua a lot easier. Beach location at Bali's premiere beach, Nusa Dua. Nusadua Penthouse Residence is ideally situated on its southern boundary which it shares its beach club with the St Regis, with the Marriot Hotel to the north, the Hotel Bali Age to the west and the Hilton Hotel on its eastern boundaries. The Nusa Dua complex comprise, all within minutes either by walking or courtesy shuttles, several international hotels, the Bali Collection entertainment/lifestyle/dining complex, a championship golf course is within 5 min walk, the Bali Connection shopping corso and some of the most spectacular white sand beaches. Located only 10 km from the Bali International Airport and 15-25 min from the tourist areas of Kuta/Legian/Seminyak. Nusa Dua is definitely the area we recommend to anyone looking for comfortable accommodation in a safe and clean environment, with great pool and beach facilities as well as endless dining options within walking distance. Other Activities: Spa treatments, art shopping, kayaking, site seeing, eating, Art gallery of Asia Pacific out etc.